Revan now makes up over 90% of all teams at rank 1 in arena. CG has finally accomplished their goal of only having one meta. He was too easy to get (yes, I'm serious) and they brought him back too soon. Now everyone has him, wall to wall Revan, and it's no fun for anyone. I seriously hope the most recently released OR characters aren't the only requirements for Darth Revan, because virtually everyone has them (or is close to having them) as well. They brought back Jedi Revan far too early. And they are waiting too long on Darth Revan/Malak. The new event should be starting 3/14, but sadly it looks like another week at earliest. First jedi Revan event was 10/18, 3 weeks after required toons dropped to nodes. 3 weeks after carth dropped would make it tomorrow. Doesn’t make sense they would wait to be “nice”. Would anyone get upset if Revan/Traya got nerfed in an effort to restore balance to the force? Would not take a huge amount.. Some among us have fully diapered babies with all their vaccinations up to date. Others among us have chosen to prioritize their Revan squads and their babies are wearing dusty newspapers from 2007 as diapers, and get a monthly spray of Windex glass cleaner for their vaccinations. GG is phenomenally good on offense a shardmate uses him and they cut through Revan at g12 like nothing. When people get the droids to g12 and mod correctly, they will see. But he is flawed on defense. Not terrible, but flawed. Edit - side note: I would be careful with the "virtually everyone". This forum is skewed towards the players who are very invested in the game, the general playerbase might be very different. Revan is to easy to get (easiest legendary for now) and his leaderability is too strong. Not really he is to strong but the "new" Yoda ist too strong and Jolee is awesome, too. The combination is the problem ... not Revan. /Edit: Maybe CG thought a typical Revan-Team would be old republic and the developers "forgot" the old Jedi. It’s easy to “nerf” Revan without Nerfing him. You introduce a new character that is a hard counter to Revan and is Plug and play into several teams. Would depend on what the change was. I played another mobile game previously that had a similar situation - one character utterly dominating the game and making it a chore to play because you either used him or lost. When they nerfed him, though, they went so completely overboard that he went from being godlike to completely useless (like Ugnaught-level garbage), which **** a lot of people off. The problem is, people don't understand what 'easy to get' means. What percentage of the playerbase has revan? - while it's most of the top end of arena, this is a self-fulfilling prophesy. If say a shard has 20,000 players on it, 5,000 active - you only need 1% of them for the entire top 50 to be revans, or 2% for the top 100. What percentage do you think GC wants people to get the new content (I bet most who have him, have spent something on him - or at least focused highly/high arena players). I tend to be top 5 most days on my shard, that's with sharing timeslot with many - but a vast majority of my guild don't have revan & they do play daily. Most people are not top 20 daily arena players. Most are not pulling in the crystals required to get these characters even on the second coming. This isn't about whales vs. f2p - not even close. Most players HAVE Revan - and he's ridiculously OP - that's why everyone runs him. Not just whales. If you want to compete in arena you have to "run" Revan (or at least put him on defense so you don't drop like a rock). I'm not arguing about whales vs. f2p or anything. What I meant was that whales paid hard for revan the first time he was introduced and now CG doesn't dare to take away their toy. This is of course entirely on CG for making revan so stupidly OP in the first place. They would rather let it destroy the arena balance and then they would artificially "miss" the perfect opportunity I was talking about (GG "the jedi killer lol" rework). Heck I even wonder whether the game-balance-aware devs first recorded all those vids with GG handing revans **** to him and then someone at the top realized "oh noes! revan challenged..reverse thrust!" It's easier to get Revan than it is Traya. Just takes patience to get Revan. Traya is the real deal. If by "most", you mean about 10%, then I would agree. Yes, and now they have completely ruined Traya's viability, one of the hardest toons to obtain, she stinks compared to Revan, everyone does, it is just stupid how OP he is. 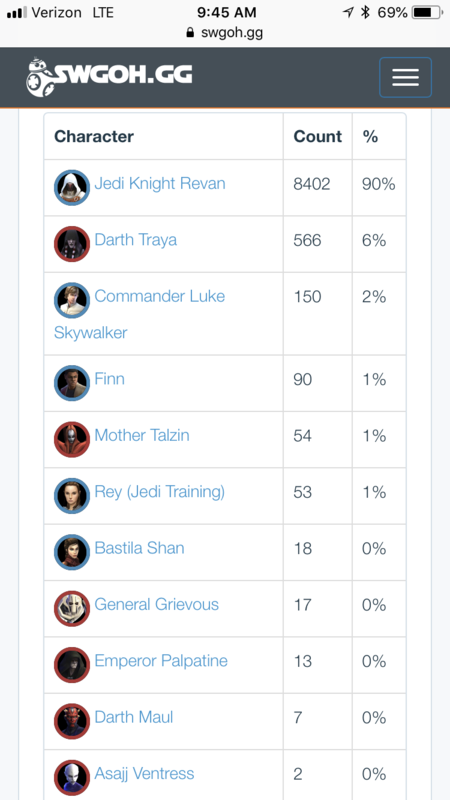 In my arena shard (years old) there are now only TWO traya in the top 50, and 48 Revan, and the 2 traya are in the bottom 25. So Traya who takes forever to obtain, is now not even competitive at top level, sad really. Why would Traya need to be nerfed when she's only 6% of the meta? Makes no sense.